Salmon promotes eye health. Salmon is rich in omega-3 fatty acids which help lubricate dry eyes and the vitamin D in this fatty fish protects against macular degeneration. Eating salmon may improve your mood. 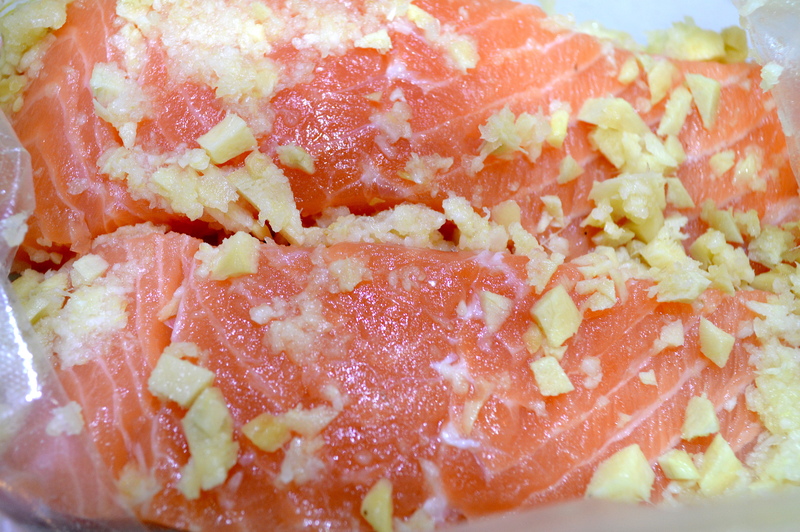 Salmon contains tryptophan, a precursor to serotonin, a neurotransmitter associated with mood regulation. Studies show the omega-3 in salmon help depression. Eating salmon will help raise HDL cholesterol (think H for Happy). This is the good cholesterol. If mercury is a concern for you, no worries with salmon! Salmon is one of the lowest mercury-containing fish and the benefits far outweigh the small amount of mercury that your body can easily handle. 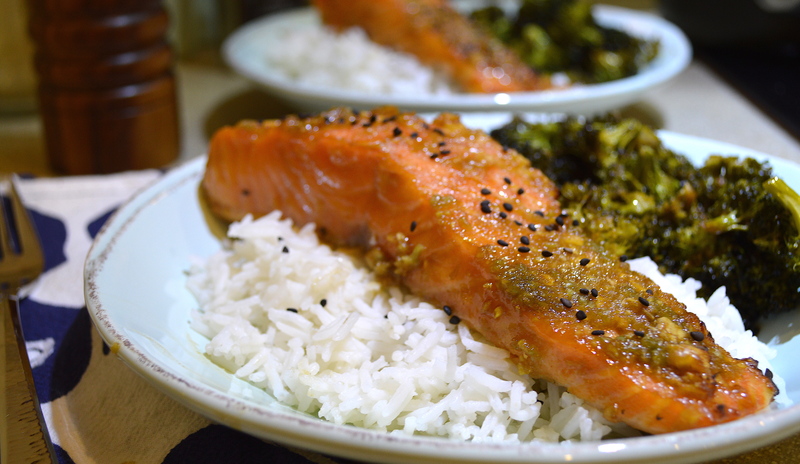 You’ll be doing your kids a big favor by feeding them salmon! The brain continues to grow from birth to age 20. Omega-3 fatty acids are essential for developing brain structure. Fish is a great source of protein, iron, calcium, zinc and magnesium. Salmon is a good source of B vitamins like niacin, vitamin B6 and B12. B vitamins are necessary for maintaining your body’s metabolic rate, providing energy and fighting off infections. Eating fatty fish like salmon will prevent heart disease, the leading cause of death in America. Other fatty fish include albacore tuna, trout, mackerel and sardines. Salmon is a healthy way to meet your protein needs. 3 ounces salmon=21 grams protein. Did you know that beginning at the age of 30, we will begin to lose 3-8% of lean muscle mass every 10 years. Eating good sources of protein helps support muscle mass. Slice salmon into 2-3 pieces. Rinse salmon and pat dry. Peel and dice a 2 inch piece of ginger. Peel and mince 5-7 cloves of garlic. 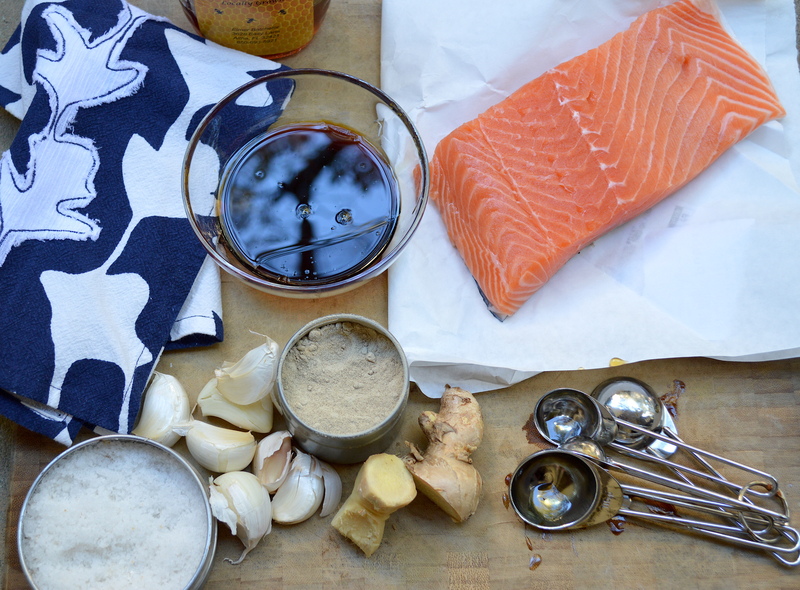 Place salmon fillets into a gallon sized bag and rub ginger and garlic into flesh of fish. In a small bowl, combine 2 Tbsp + 1 tsp low-sodium soy sauce, 1 tsp oyster sauce, 1 1/2 Tbsp honey (local, if possible) and 1 1/2 tsp sesame oil. Whisk until well combined. 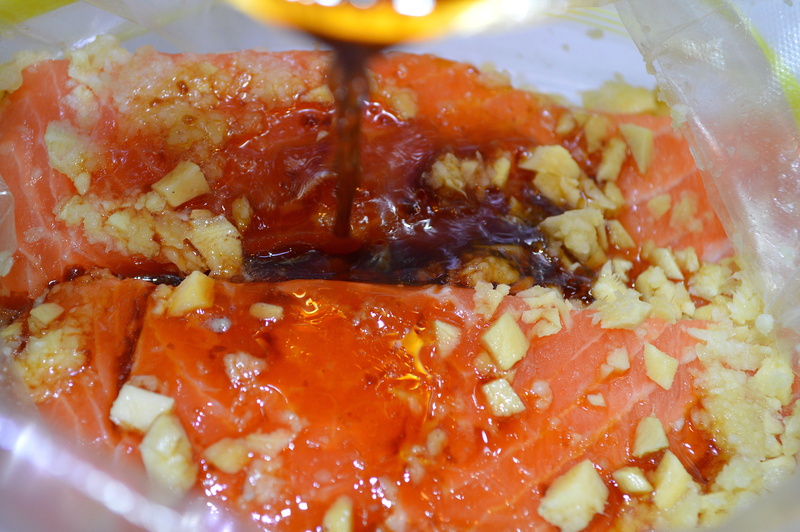 Pour soy sauce mixture over salmon fillets and seal bag. Refrigerate for 30 minutes to 2 hours. Preheat oven to 375°. Place salmon on a lined baking sheet. 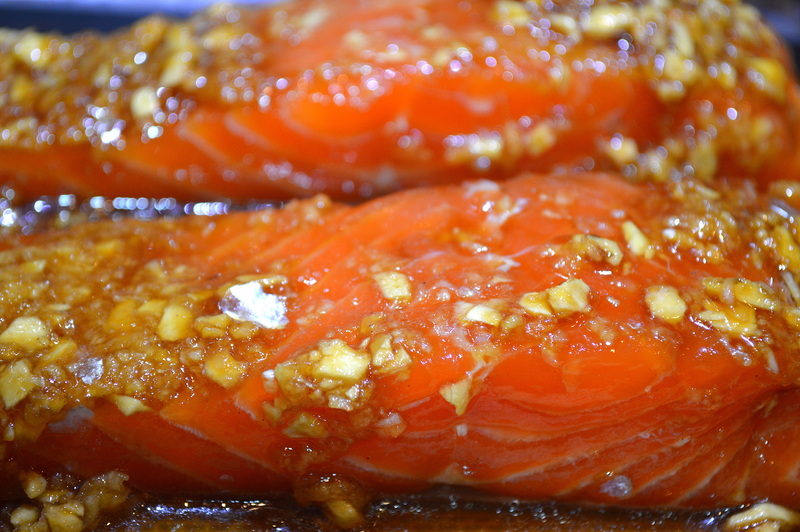 Pour remaining liquid over salmon and bake for 15 minutes or until the surface turns brown. Serve over a bed of Jasmine rice. I added a side of roasted broccoli. You’ll find the recipe in this post: Gonna Need to Run Extra Miles for This One… I left it in the oven on warm after roasting and it lost its beautiful, bright green color. I’ll need to work on my timing a bit for next time. My toddler ate so much of this, I felt like a good parent! After dinner he had an orange and a banana! What a healthy eater! It doesn’t always come naturally, my friends. You must offer new foods repetitively. Don’t give up. If they taste it and spit it out, thank them for trying and try again another day. I’ve offered broccoli to my son since he turned 6 months old and could eat solid food. He is 2 1/2. He is finally starting to like it and gobbled up every “dinosaur tree” on his plate! 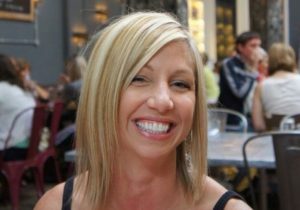 Here’s the recipe for the salmon: something you may not know: getting your kids to eat healthy is not impossible! Get your kids involved in the kitchen. Let them wash the veggies, tear lettuce, stir and pour in ingredients. Getting kids involved as little chefs is the best way to get kids to try more foods!! Be a good role model and don’t force anything. Kids need to try a new food at least 15 times before they can decide if they like it. Encourage them to try something new and if they don’t like it, don’t push it, just try it again later. Nothing Can Grow in That! You also want to always buy “wild caught” salmon and not farm raised!